Instead of jumping into surgery to fix injuries or restricted movements, many individuals opt to try physical therapy to strengthen damaged muscles, correct improper form, increase mobility, and relieve pain. At Neck and Back Medical Center, our team of therapists and medical doctors are trained to develop effective rehabilitation and physical therapy techniques. Because physical therapy plans are developed on a case-by-case basis, patients will get a program tailored to their specific needs. 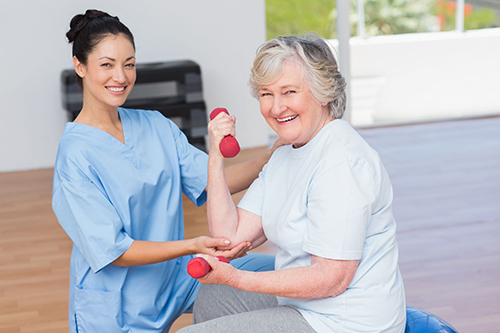 During physical therapy, patients play a huge role in their own recovery. This can be both rewarding and discouraging, so it’s important to remember that physical therapy takes both time and patience, but it will be worth it. Neck and Back Medical Center offers customized physical therapy programs for spine and joint rehabilitation. By strengthening the muscles and joints around the spine, we restore proper comfort and function while resolving pain. Using a unique method of pelvic stabilization, we provide true isolation of the deep muscles of the lumbar spine. Since this muscle group is often the cause of lower back pain, continuous physical therapy to strengthen the lumbar spine can correct pain and return a full range of mobility. To learn more about Physical Therapy treatments at Neck and Back Medical Center in Laguna Hills, California, reach out to us at info@neckandback.net or come into our clinic for a visit. We hope to help all of our current and future patients reach their maximum level of function and comfort.